As you know, Mommy is not getting any younger anymore and my body parts often ached here and there, my head specially. Ever since, I am not fond of taking pain relievers so I resort to ointment and liniments to ease the pain. If anyone will raid by bag, they will find SalonPas Liniment, Katinko, Tiger Balm and Vicks Vaporub. I am such an oldie, baby haha! 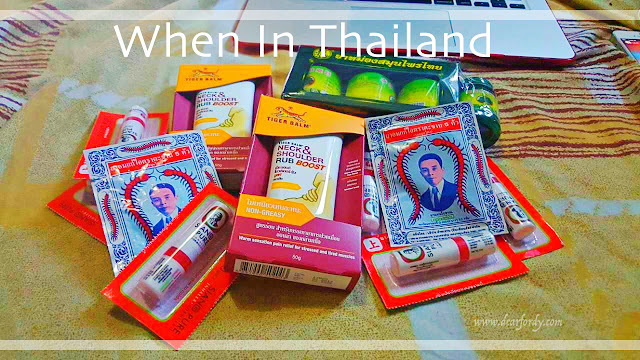 My pahid-pahid haul from Thailand! I got 3 Takabb Anti-cough Pills. I don't know how many are in a pack but they are like tiny copper pearls, like beads. I tried 2 today since I have a bad cough. It comes in 4 flavors; mint, plum, lemongrass and herbal, your Tito got me herbal so it tastes like blah but I have no choice. It promises to ease coughing and true enough, the cough went away! Magic? Magic. It costs 15 baht per pack so like Php 21.60. Not bad. I also got Siang Pure Inhaler. Oh god Fordy, I badly need this! It has a two way design. One end is an inhaler to ease stuffy nose (which I have right now), faint and dizziness. The other end is for drops so you can use it to ease flatulence, muscle pain and insect bites. Tito Adey got me 6 pcs for 100 baht so one piece is like Php 24. Then the famous Golden Buddha Herbal Balm. The pack of 3 comes with 1 pc free, hurray! Your Dad got the free one. It is like efficascent oil in a balm jar. No mess! It also is 100 baht for the 3 jars. Finally, I got 2 of the Tiger Balm Neck and Shoulder Rub! This is the best of this haul. You know how Mommy's neck and shoulder always ache after long hours of staring at the computer screen, no exercise at all? The local Tiger Balm can no longer ease it. Well maybe yes, but it doesn't last. This rub I know will solve all my problems. This one though costs 200 baht per tube. That is Php 288 haha! Well, I am one happy mommy today, Fordy. My body aches I know, finally will not bother me anymore. At least until I have these with me. Who cares if I am "amoy matanda"? I sure will have Tito Adey buy me more when he travels back to Thailand. Oh well, I know, I know, I told you I am going to sleep. I just saw the box with them inside and I got excited. And yes, I am waiting for the nose strip I put on your Dad's nose to dry so I can peel it off. Lately, he is becoming more "kikay" than me. Till my next letter bubut!